A creamy vegetarian Cheeseburger based on pea protein and wheat protein. 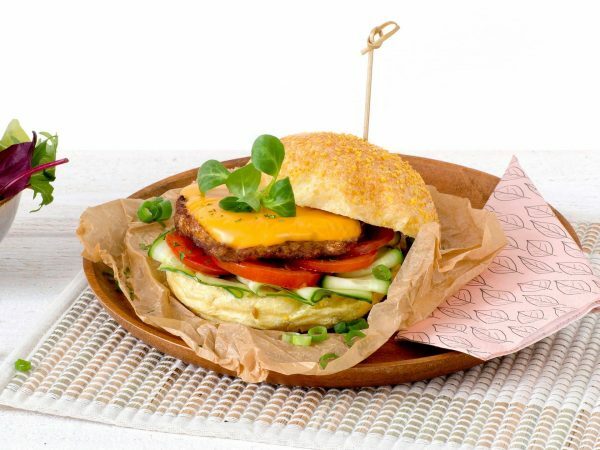 This vegetarian Cheeseburger has a firm bite and is richly mixed with stringy vegetarian cheese. A Cheeseburger weighs 85 grams. Water, vegetarian cheese 32% (milk, salt, lactic acid, vegetarian rennet), vegetable proteins (wheat gluten, pea), chicken egg white*, herbs and spices, modified corn starch, sun flower oil, starch (potato, wheat), dextrose, garlic, salt, flavouring. *Egg white is from free range chickens. Made in a facility that also processes soya, peanuts and nuts. Frying pan: 4-6 min. on a low fire. Turn every now and then. Oven:10 min. at 180°C. Turn once. Microwave: 1 min. at 900W. Barbecue or grill: Rub with (olive) oil. Grill on both sides for 2 minutes.